Why is finding a basic necessity so difficult in New York City? You manage to find that t-shirt you've been looking for, you successfully navigate the subway system without getting lost, but finding a clean restroom while you're exploring the city can be an arduous task. With locations on nearly every New York City block, this is an always popular option. The popularity means there might be a line, but the baristas are happy to give you the key whether you make a purchase or not. Barnes & Noble has locations throughout the city. Located near the library on 42nd Street between 5th & 6th Avenues, when the park is open, I've found this public bathroom to be surprisingly clean because there is always an attendant. Grand Central is located off 42nd Street between Park and Lexington Avenues. You can find the public restrooms downstairs near the food court. Located at Mercer and Houston, you can access the restrooms in the café area, which is open to everyone regardless of whether you are a ticket holder. Both located on Fifth Ave. between 13th and 15th St. these are a hassle-free choice when you're in the area. Both located on 6th Avenue near 18th Street, they offer a clean respite in the area. Other than the dorms, any building with an NYU flag, which you can't miss when you're in the Washington Square area, will have accessible facilities. These work best if you can blend in as a student. Located below the Plaza Hotel (easiest entrance is on 58th Street just west of Grand Army Plaza), there's an easily accessible and well-kept restroom. There are locations all over NYC, but the one near Brooklyn Bridge/City Hall at 55 Chambers Street is one that a reader recommends. The large, clean and gender-neutral bathroom is a great option on West 13th Street. Head to the 2nd floor on the right as you exit the escalator for the women's bathroom. This upscale shopping mall has luxurious public restrooms. They have well cared for public restrooms -- kind of surprising given the vast number of tourists that come through this area. At 301 Park Ave the art deco decor is worth a peek, and if you are looking for a bathroom, it's a good choice between 49th & 50th Streets. Located in the heart of Times Square at 1535 Broadway, the bathrooms here are top-rate (& located on the 2nd floor) if you can blend in with the business people and tourists that stay here. Although it's rumored the doors aren't the easiest to open in these bathrooms/modern works of art, they're well worth a visit. 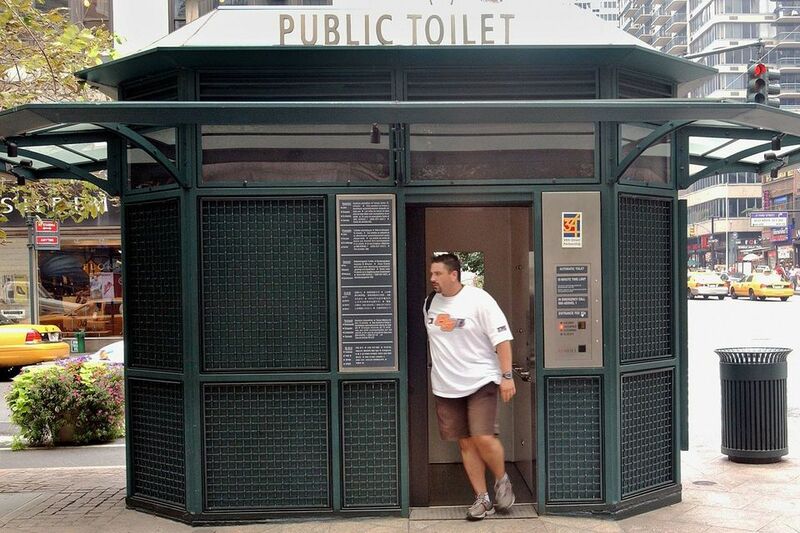 Located on Grand and West Broadway, where public toilets are scarce. Walk past the front desk and continue down the back corridor to find the bathrooms. You have to wait for someone with a room key to go in or out and casually catch the door, but once inside, you can use the facilities.